Next message: Aldo Buratti: "Re: MSC-News: Partial and Total ordering of MSC"
Previous message: Aldo Buratti: "MSC-News: Partial and Total ordering of MSC"
In reply to: Aldo Buratti: "MSC-News: Partial and Total ordering of MSC"
Next in thread: Aldo Buratti: "Re: MSC-News: Partial and Total ordering of MSC"
Reply: Oystein Haugen: "Re: MSC-News: Partial and Total ordering of MSC"
I have a clarification request about the partial ordering of MSC events. the relation "out(m1) < in(m1)" has not been listed ? ii) relation 4 ...sorry... I don't understand !! You must remember that the environment has no order. Actually there are no events on the environment at all in the formal interpretation. We cannot know what happens outside our MSC frame. 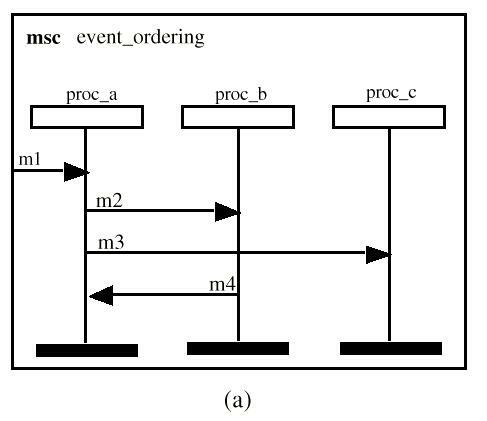 If you think about it you will find this reasonable if though you sometimes know in which order environment events take place, but this must be described in another MSC referring to the one you use. What's right and what's wrong ? drawn above the outgoing event"
the rules (2) and (3) ?? saw a lot of such patterns). way), can be legitimated by adopting an "implicit" coregion ? This could have been another interpretation, but we decided rather to disallow the construction because we were not sure that your interpretation would be the only intuitive one. order, that is like in a coregion. "In the same time" has absolutely no meaning in MSC. Again the reason for disallowing the construction was the risk of misinterpretation from human beings.